Location нос Калиакра | Imprint.BG - the only producer and operator of the popular souvenir machines for Bulgaria. The machine is placed to the left of the entrance of Museum Kaliakra. 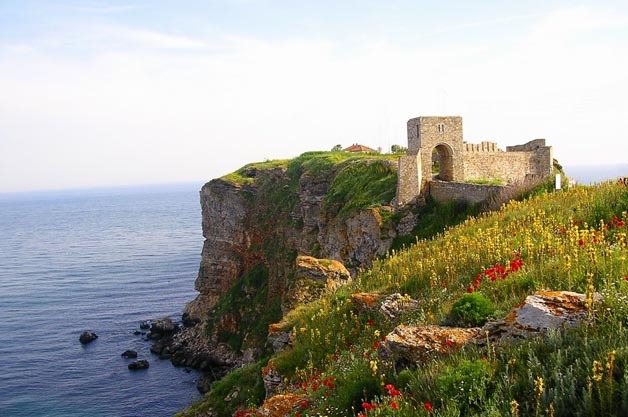 Kaliakra is a long and narrow headland in the Southern Dobruja region of the northernBulgarian Black Sea Coast, located 12 km east of Kavarna and 60 km northeast of Varna. The coast is steep with vertical cliffs reaching 70 m down to the sea. Kaliakra is a nature reserve, where dolphins and cormorants can be observed. It sits on the Via Pontica, a major bird migration route from Africa into Eastern and Northern Europe. Many rare and migrant birds can be seen here in Spring and Autumn and, like much of this coastline, is home to several rare breeding birds. The rest of the reserve also has unusual breeding birds; Saker Falcon, Lesser Grey Shrike and a host of others.